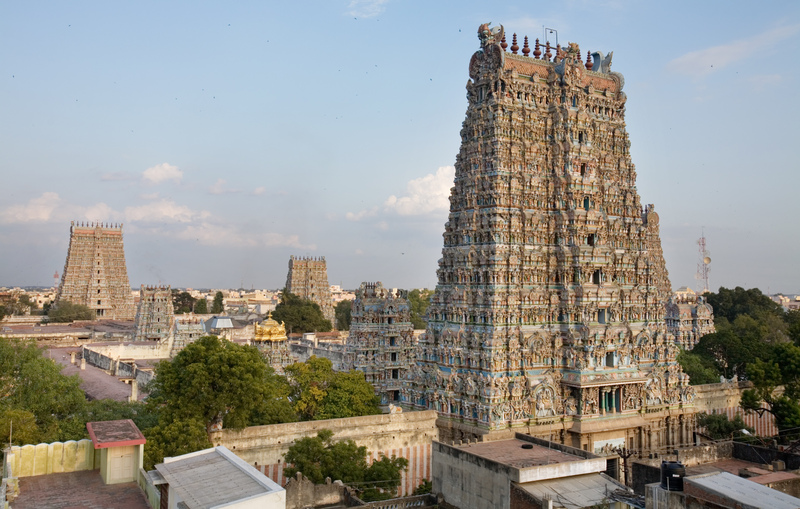 The temple is the geographic and ritual center of the ancient city of Madurai and one of the largest temple complexes in Tamil Nadu. The temple complex is divided into a number of concentric quadrangular enclosures contained by high masonary walls.It is one of the few temples in Tamil Nadu to have four entrances facing four directions. Designed in 1560 by Vishwanatha Nayak, the present temple was substantially built during the reign of Thirumalai Nayak(1623–55).Vishwantha Nayaka allegedly redesigned the city of Madurai in accordance with the principles laid down by Shilpa Shastras(Sanskrit: śilpa śāstra, also anglicized as silpa sastra meaning rules of architecture) relevant to urban planning. The city was laid out in the shape of square with a series of concentric streets culminating from the temple. These squares continue to retain their traditional names, Aadi, Chittirai, Avani-moola and Masi streets, corresponding to Tamil month names.Ancient Tamil classics mention that the temple was the center of the city and the streets happened to be radiating out like lotus and its petals. The temple prakarams(outer precincts of a temple) and streets accommodate an elobrate festival calendar in which dramatic processions circumabulate the shrines at varying distances from the centre. The vehicles used in processions are progressively more massive the further they travel from the centre. The complex is in around 45 acres (180,000 m2)and the temple is a massive structure measuring 254 by 237 meters.